Crisfield is Maryland's Southernmost Town on the Eastern Shore! National Hard Crab Derby & Fair includes crab races and crab picking contests, a parade, boat docking, a carnival, arts and crafts, seafood, entertainment and fireworks.The festival kicks-off on Thursday evening with a carnival, runs through the weekend ending Sunday night with a Gospel concert and fireworks. Baltimore Clayworks is proud to announce its 35TH ANNIVERSARY SHOW and three new exhibitions in our galleries starting September 4 at 6PM. 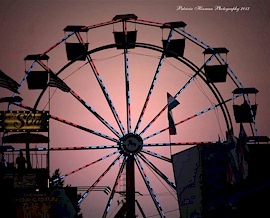 Show continues through early Oct.
No other event provides so much food, fun & family entertainment for so little: tame & thrilling rides and games; traditional Fair & local farm fresh food; thousands of livestock, horse, farm & garden & home arts exhibits, live thoroughbred horse racing;live Ntl. & local concerts & more. Skipjacks race takes place Monday at 9:30 am. Island Fest is three days of parades, a 5k, bike races, a fair, great, local food, the blessing of the boats, and even the Miss Skipjack contest. Of course the highlight is the legendary Skipjack race. Written By Bekah Brunstetter Directed by Amber Jackson WORLD PREMIERE A tale of two young women, both named Jane. One is an awkward middle schooler the other is actually in the game, living through the hardships of trail life with her family, totally unaware of her capricious fate as a character in a classic video game. An exhibition of 45 works of art from 1941 to 2013 highlights the ways artists have used technological innovation to create artistic revolution. The 2015 Monty Alexander Jazz Festival will celebrate its sixth anniversary in Easton, MD on Labor Day weekend from September 3 - 6, 2015. More than 50 theaters, universities and playwriting collectives will stage readings and workshop new works. Les Rayne offers different styles of music, and the performance will have a variety show format. This performance will be held in the Gallery of the Dorchester Center for the Arts. Commemorates the Battle of North Point, part of the defense of Baltimore, when British troops invaded in 1814. Performance by Brown Box Theatre of "The Taming of the Shrew"
Max Major returns to the Baltimore Theatre Project with an all NEW experience, THINK AGAIN for one night only. Drop in this afternoon to chat with costumed interpreters preparing dinner in the cabin’s hearth. Find out what Banneker and his family grew and ate. The D.C. Blues Society hosts its 27th annual event featuring performances by Sharrie Williams, James Armstrong, Full Power Blues, the Mojo Priests and Jackson and Oziel, plus music workshops, an instrument petting zoo and other children's activities. Come join us as we explore one of the gentlest rivers in the Baltimore-Washington area, the Patuxent River. Our experienced and entertaining guides will explain the basics of kayaking from paddling to steering and how to safely enter/exit your kayak. We often see many different kinds of wildlife like birds, fish, and turtles as we meander quietly on the many coves and inlets. About halfway through we will stop to enjoy a snack we provide before heading back. The patriotic program includes performances by the orchestra led by Steven Reineke, vocalist Kate Davis and the Soldiers' Chorus of the United States Army Field Band. Barbequed Pulled Pork and Brisket. Food and Entrance Complementary. Donatons/Proceeds benefit Catoctin High School. Two live music acts. No outside alcohol permitted. See website for details. A family-friendly afternoon of arts, crafts, music, dance and food takes place the first Sunday of each month. Remember the Titans--There’s no better way to enjoy the season than Movies on the Potomac at National Harbor. View a vast array of films under the stars. See all of your favorite WWE Superstars in action as WWE Live returns to the Wicomico Youth & Civic Center in Salisbury - only time this year! Prices: $95, $70, $55, $35, $25, $15. Pedal through hundreds of acres of gently rolling forested hills and tidal bottomlands to the panoramic vista of the Potomac River. 17, 32, 46, 60, 100 mile options. headlined by one of the hottest, young, energetic hip-hop superstars today, Rich Homie Quan. Quan will be joined by radio hit maker K. Camp and also featuring other trendsetting, music stars; Jacquees, Diggy, Justine Skye, Silento, Elijah Blake, Rawyals, Anthony Lewis, Chris Miles, 4EY, Star Mic and some other special invited guest stars.